At 0.5 people per square mile, Harding County, South Dakota is one of the least populated places in the nation. The county’s only high school, located in Buffalo, is small by even small-town standards, with 85 students in grades 9-12. However, few schools can match its gridiron success. 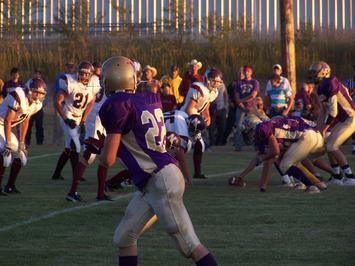 Nicknamed after the primary industry in the region, “The Ranchers” football team has experienced only one losing season in its 44-year history. Harding County’s teenage boys suit up every Friday night and dominate 9-man football. Nine-man football is a small-town sport. Unique to three upper Great Plains states (South Dakota, North Dakota, and Minnesota), it was designed for rural high schools, where mounting a standard 11-man team simply isn’t feasible. The first three games of the 2010 season are already in the books, all three ending early due to the 50-point mercy rule (any time after halftime, a 50-point lead wins the game). The Ranchers have so far outscored their opponents 172 to 14. The Ranchers play on what many regard as the worst football field in South Dakota. “We tried raising grass on the field last year,” laments assistant coach and school principal Josh Page. “We laid some sod, but it died out.” The field is too muddy to use when it rains, and when it’s dry, clouds of thick dust blow across from the adjacent rodeo grounds. It’s not unusual for Friday night Ranchers games, originally scheduled for their home field, to be forced to move to their opponent’s school, due to unsuitable playing conditions. Visiting teams consider this good news -- over the years players have come to dread the invasive cockleburs populating the Harding County High School football field. Located in the farthest northwest corner of South Dakota, Harding County is known to paleontologists as the T-rex capital of the world -- more T-rex fossils have been found here than in any other place on earth. It has a population of 1,353 people, spread out over 2,678 square miles. The region boasts the nation’s coldest winters, punctuated by fierce blizzards that are capable, even today, of immobilizing residents for weeks at a time. When its High School team members are not playing football or going to school, most are working on the family ranch: branding calves, wrestling steers, herding sheep, or moving hay. Many are the third or fourth generation on the land. When they start practice in August, the players are in shape and ready to work hard. Sure, they have a little swagger, notes Coach Wammen, but it’s been earned by their success. Whether they win or lose, away games constitute a long ride home over vast stretches of two-lane roads. The conference has nine teams and encompasses an impressive 38,000 square miles, with the farthest regular season game 213 miles away. Yet even with an average round trip of over 250 miles, Harding County fans often outnumber those of the opposing team. “The whole county comes,” according to Nora Boyer, the erudite 78-year-old volunteer curator at the Buffalo Historical Museum. “It gets pretty nippy around November and some people watch the game from their vehicles, but I say, if you sit in your pickup truck, you can’t holler.” Many of the players have fathers and grandfathers in the crowd who, when they were teenagers, played for Harding County High School. Both Brown's and Jenson’s fathers played for the Ranchers in the early 1980s. Jenson says, “My dad played Harding County football when he was in high school. But,” he adds with a sly grin, “I don’t know if he was any good. You could ask him . . . but he’s out moving hay.” The fathers of both the Ranchers’ head coach and assistant coach played football together on the same field that their sons coach on today. Coaches Page and Wammen are too young to have boys of their own on the field, but, most townsfolk believe it’s only a matter of time. People in ranch country are patient. Places as isolated as Harding County are sometimes referred to as 'the middle of nowhere'. But for these exceptional football players, it’s not 'nowhere' -- it’s 'now' and 'here'-- it’s their past, it’s their future, and it’s one of the best places to grow up in America. Debora Dragseth, Ph.D. is an associate professor of business at Dickinson State University in Dickinson, North Dakota. She trains and develops leadership curriculum for CHS, Inc. a diversified energy, grains and foods company. The Fortune 100 company is the largest cooperative in the United States. Dragseth’s research interests include Generation Y (Millennials), outmigration and entrepreneurship. Submitted by Sophia Turley on Tue, 05/21/2013 - 02:58. Super Bowl is the informed name, given in which 1967, for this professional football tournament contests, which lengthen again into antiquity, Roman antiquity to be precise. This is going to be Super Bowl XLIV, in order to honor those Roman root base of gladiatorial contests. The New next Super Bowl game coming in the 2014 if you want to buy 2014 Super Bowl tickets then you visit TicketDove.com Where you can buy the cheap rates tickets. Submitted by Owen McShane on Sun, 10/03/2010 - 16:24. I posted a comment about 7 a side rugby yesterday and it seemed to go through but has disappeared this morning. Any reason? Have I got some virus deleting my blog comments? Submitted by Tom Harned on Sat, 10/02/2010 - 13:38. This was one of the most interesting NG posts I've seen in a while, not that the others aren't interesting of course. The author did a great job of highlighting a community that most of us would never have even known existed. It made for an enjoyable read and reminded me of the old "zip code" profiles that National Geographic used to have at the end of each magazine. Submitted by Jay on Sat, 10/02/2010 - 11:24. I enjoyed reading this. A nice window into a part of the country that most of us have never made it to. Thank you.